Anyone up for an opening day/weekend get-together or some such in the Kerrville area? I have to work all day, but gonna head out to the lease this evening and be in one of my stands in the morning. I got a fatty coming in lots of doe so we shall see what happens. We'll be off CR 460 punching the trigger. Need to draw blood; I feel sorry for the first hog that walks in. Does are safe for now. Bachelor bucks safe, unless the big boy is traveling with them. Ugh I COME ON MONDAY!!!! I can’t be there this weekend but I’ll be there Monday for sure! Man we are really slow in SE Menard county, too much green around up here. It’s been a beautiful morning so far, 7 does, a spike, and this 3 year old 8. I love this time of year! I watched 14 bucks feed on my hand corn this evening and not one went inside the feeder pen. Passed on this guy named potential who needs one more year. Oh my goodness Hoghunter!! Heck of a buck! Well, I had some nice sits this opening weekend. I saw 10+ deer each hunt at my feeders. Lots of nice up and coming younger bucks. We have acorns, but it isn't horrible. 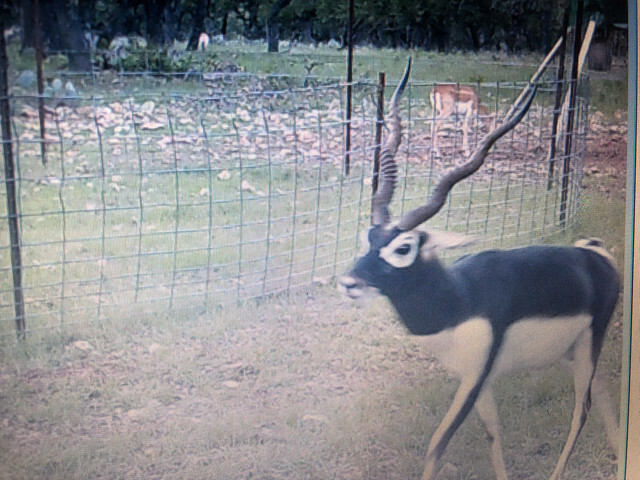 I was able to make a stalk on some Blackbuck Doe and luckily the cows helped me get to 42 yards. Was able to get an arrow in her, and she piled up about 40 yards away. Got lots of work down and even watched some football. Great opening weekend and can't wait to get some of my older bucks on camera or in front of me. 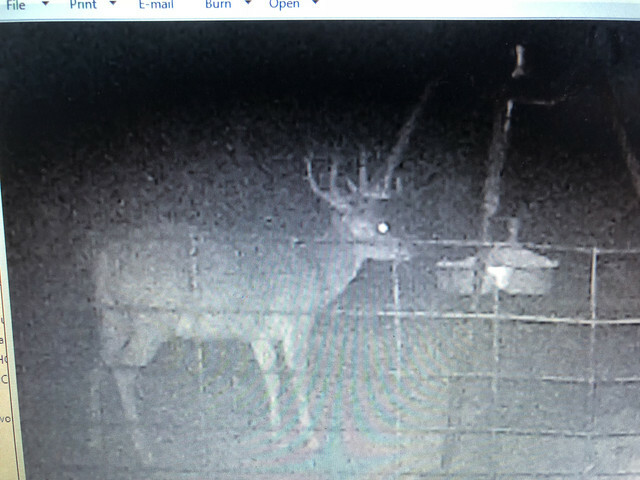 This is my target buck named Bob for this year. Another lease member is after him too and he splits his time 50/50 at our stands so we shall see how the season works out. Just being back in the deer stand was an awesome feeking, exciting start for sure! Some good looking deer guys. Who all is headed out this weekend? Bob is a NICE deer. Good luck getting him. We're headed down to the lease tomorrow. Hoping for a bloody arrow. Be on the road tomorrow to San Saba. Got a new bow. Gotta make something leak hopefully! Thank you, he's always I've between my pasture and my buddies so it's a 50/50 shot at getting him but he has been to my stand most mornings. We were at our place in San Saba this weekend. It is lush & green. Looks like a rainy early spring. Been a month since we were there. Really slowed down on the protein & waterers. Still had deer come in at every sit, but they don't stay & clean up the corn. Eat some & then start browsing on green. I checked every area around our feeders & saw no acorns on the trees or ground. Talking to a guy in town ,he said some areas have acorns & some don't. Getting rain now & hope it continues. Love seeing the place look like this. Didn't release on anything, had 1 really nice wide 8 ,but he is about 4. Was hoping the hogs would show,but they didn't. Be back up this coming weekend & looks like it might be cool. I just set it Friday around 1, so that may have contributed to the lack of deer, but I think it was more the heat as there were plenty the next morning. And the tank filled way back up. This is close to 20 feet deep when full and was bone dry before the September rains. No blood, but a good weekend. The place and animals are looking good BBS! The evenings are where it's at lately. I saw my target buck, Bob, last night but he would not come to the hand corn out in front of me. I saw over 20 different bucks and a few does. My other lease member also saw Bob yesterday morning but couldn't get a shot. He is down there for 2 weeks so I'm hoping Bob will still be alive by next weekend. ^ super nice one there. Your lease mate has the upper hand I am sorry to say. Thank you sir, yes he does but only time will tell. He primarily lives in my section but it's only a matter of time when he slips up. Friday night he followed his routine and gave me a quartering away shot at 22 yards! We were at our place in San Saba over the weekend. Had 3.2 inches of rain last week & .60 Sat afternoon with more forecast this week. Country is lush & wet. Deer not hitting feed much. I sat 3 times & never saw a deer, did see some at camp feeder Sat AM. Son saw a few. So glad to see the country like this after the brutal summer we had. We had our co-op meeting Sat & fawn crop is way down this season. Hoping for better conditions next spring & the does drop a lot that make it. 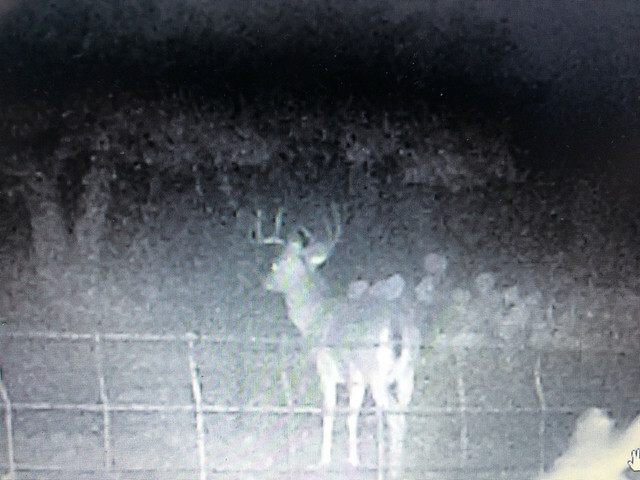 We do have some nice bucks around & hoping 1 slips up later in the season. Amazing buck hog hunter! So glad you got him down! I’d love to see the measurements if you are so inclined! We are seeing the exact same thing DUKFVR. Very low fawn crop. I bet we are around 20% max. I love seeing the ranch in the shape it is in now, even though I hate how slow the hunting is for the lease hunters. There is no way I’ll complain about too much rain, we’ll take as much as the Lord wants to give! Amen Puncher on the rain! Raining right now at our place. Our fawn crop was estimated at 30%. If it keeps building as it’s moving South we should get some more as well. Thank you very much! He scored 149 5/8" gross. 17" inside spread, 11.5" left G2 and 10" or more G3s and other G2. 20"+ main beams with all mass measurements from 3"-4". This is him from 4.5 in 2017 to 5.5 in 2018 during a bad drought year. Did he break off part of his right brow last year? If not, they alternated lengths. Awesome buck! I hope that one day we can get to where y’all are. Top notch! He broke off his left side G3 last year and did not have a G4. This year he grew some trash at the base of his left brow and it made a 90 degree bend so that is why it's shorter. We are at 4.2” since midnight! Tanks should be completely full now. Answered prayers! 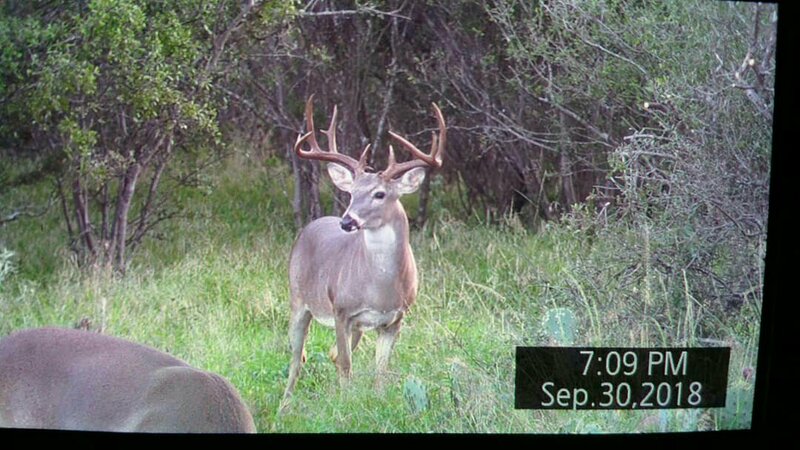 He’s a stud of a buck! So glad you were able to harvest him and share the pictures with us. It’s more than obvious that your management plan is working. Thank you. Best advice I can give is just never shoot any deer under 4.5 years old and resist the urge to shoot a stud 4.5 year old by telling yourself the neighbors will shoot him. We have rifle hunters on 3 sides of us so they get several good deer each year but the ones they don't get are our trophies the following year. If we would've had a wet spring I think he could have been pushing 155. Nice guys! 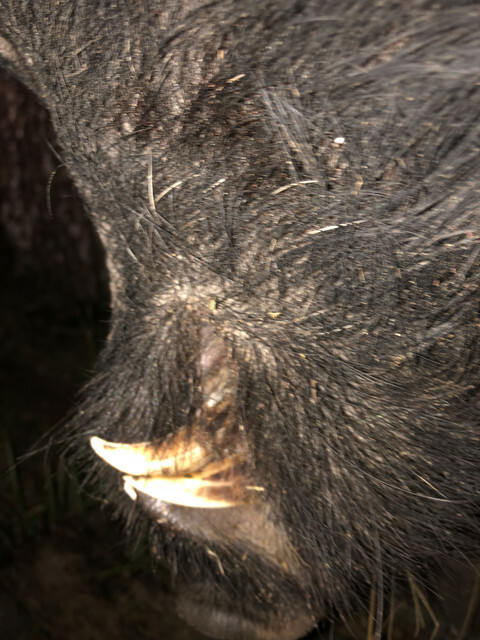 Finally caught up with a boar that has been harder to hunt than any deer here so far. He had a 3 blade rage stuck in his ear area under the skin. Such a pretty animal! Glad you got him!!! Congrats!!! What a great buck! 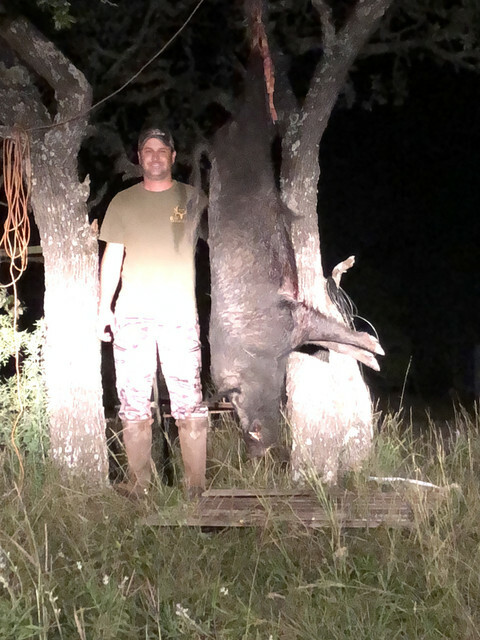 Congrats, TXhoghunter! Congrats on an awesome deer. Really cool to have some history with him too. Glad you were able to lay him down. Over 6” of rain since midnight and still coming down. They are saying it should continue through tomorrow at least. The 10 day shows great chances of rain every day. Man we’ve had a crazy last few months! Creek we have to cross to get to the lease. It was bone dry in September, and we needed some rain. But this is getting ridiculous. I hope it stops for a while so we can hunt soon. 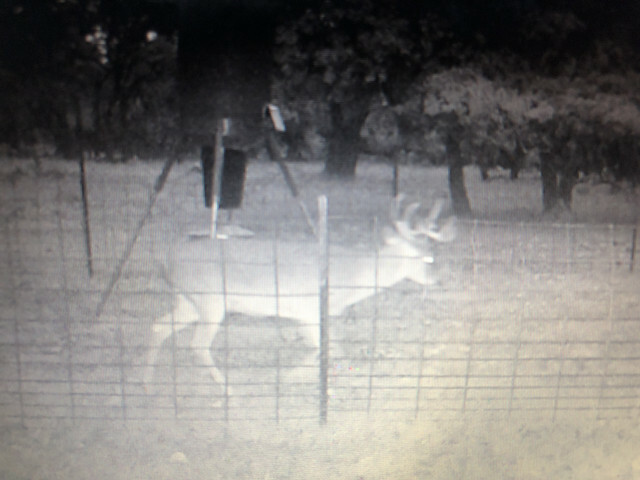 Buck my wife took Saturday evening in gillespie Co. Happy for her. Older deer for this area. They just don’t get that big. Congrats to your Wife on a Great buck! 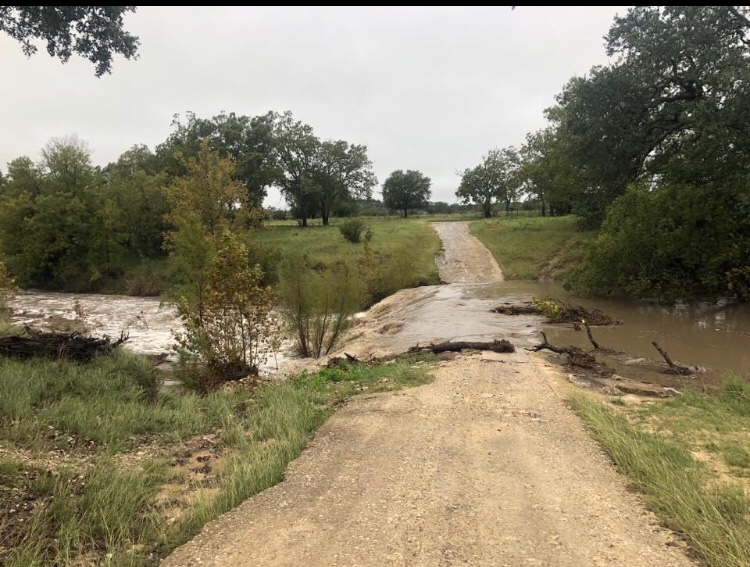 Hunt In: San Saba, McCulloch co.
Rained here southwest of San Saba all night. I tried to get to town about an hour ago. Looks like I’ll be waiting for the water to go down some. Made it through 5 or 6 low water crossings figured I wouldn’t chance on the last one. Then I tried to go around the other way.